Entry for the 2019 ACT Open is now open. To enter visit Tournament Software. The tournament will be held on Saturday 25th – Sunday 26th May 2019. Open, B and C grade singles and doubles will be held on Saturday, mixed doubles and D grade will be held on Sunday. The New Year has commenced with a flurry of activity and the Committee has already met twice on 3 February and again 3 March 2019 and discussed a number of initiatives for implementation. However, like all good ideas we need your feedback (through your Badminton Club in the first instance) to ensure we manage the expectations of all stakeholders. To do this we are undertaking a survey in March to understand the needs of our members and how ACTBA can support our affiliated clubs appropriately. The Committee has made a number of administrative decisions to transition fully to the new committee and how it operates. 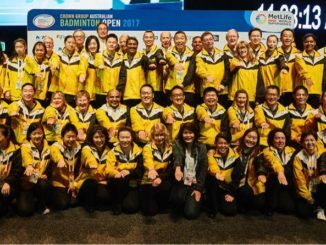 We are reviewing and developing a new business plan that will underpin how ACTBA will enhance the participation and promotion of badminton in the ACT. On behalf of the new ACTBA Committee, I would like to thank the previous committee (under the leadership of Stuart Ingram) for all their hard work, tenacity and support of ACT badminton activities in particular the tournaments, supporting clubs with memberships and insurance, sponsoring teams and providing the community with opportunities to play badminton socially and competitively. 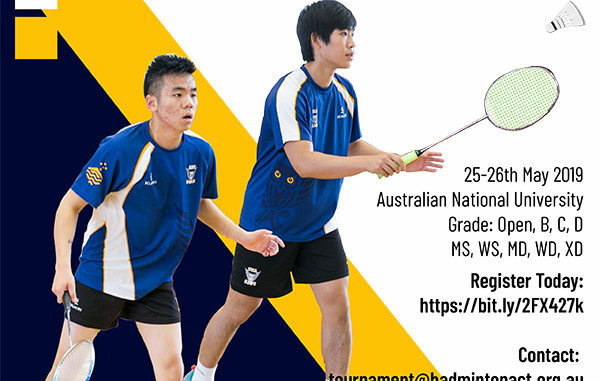 Are you looking for the opportunity to watch professional badminton up close and personal? Then line judging might be for you. A nationally accredited line judge course will be held at the 2018 CGS Open on 25th November, 9-11 am (Sunday). Read more for details on the course and registration. Telopea Park School has won both the year 7/8 and 9/10 division of the 2018 ACT Interschool Competition held last week at ANU Sport. Runners-up were Deakin High School (years 7/8) and Lyneham High School (years 9/10), who narrowly lost with 4-5 in the deciding match. The competition saw a great turnout with 35 teams participating this year! Our usual Saturday afternoon badminton sessions are on during Easter and school holidays in April 2019. No badminton on 25 May 2019, due to Premier Collectibles Show at UC High Kaleen. We will inform players the period when the Gym Floor to be resurfaced soon. CGS club will be closed on 25th April on Anzac Day holiday. Membership is now suspended and will not be reviewed again until July for possible new members for the second half of 2019. Non-members willing to pay the $15 non-member rate may not be admitted depending on the number of people attending each session; this will be at the sole discretion of the Club Committee member(s) running each individual session. Updated 3 April 2019 – Non-members who wish to play at Southside Club may not be admitted depending on the number of people attending each session; this will be at the sole discretion of the Club Committee member(s) running each individual session.